Nura Snow-Shod is a Nord priestess of Talos, and wife to Vulwulf Snow-Shod. She has two sons, Asgeir and Unmid Snow-Shod. She also had a daughter, Lilija, whom she trained to replace her as both healer and priestess. However, Lilija joined the Stormcloaks and was killed. Her daughter's death has increased Nura's strong feelings towards both Talos and Skyrim. She spends most nights and early mornings praying to the statue of Talos in Riften. Nura wakes up at 8am for a two-hour breakfast with Vulwulf and Asgeir. After this, she goes to the statue of Talos and tends it until 6pm to take a break for a two-hour dinner at her house. She then returns to the statue for the rest of the day. She is supposed to sleep at 12am, but does not due to a bug. 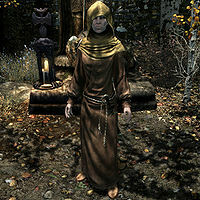 If the Imperial Legion takes over Riften, the ban on Talos worship will be enforced, causing her to stay home all day. She wears hooded monk robes and boots. She carries the key to her house, a leveled dagger, a belted tunic, some potions, a fairly valuable staff (either a Staff of the Flame Atronach or a Staff of Reanimation), and a selection of middle-class items and gold. She also carries some potions: a potion of cure disease, a cure poison, and two leveled restore attribute potions. She knows the spells Frostbite and Lesser Ward. Her greetings show her devotion to Talos, as she says things like "How can a humble servant of Talos help you today? ", "Talos bless you, my child. ", "Blessings of Talos upon you. ", and "Blessings upon you, traveler." When you end conversation with her, she will say either "Talos preserve you. ", "Talos guide you. ", or "Farewell." You can first ask Nura what she can tell you about Talos: "He's the protector of Man, the Dragon of the North, the patron of all Nords. And despite the Imperials and their treaty, he will always be one of the Nine Divines. A devout Nord would rather fall in battle and have his blood spill upon the earth than allow the Empire to strike his name from the divinity." From this, asking her "Why all the hatred for the Empire?" will have her explain, "Talos is part of our culture. He's part of our heritage and our tradition. He's Skyrim personified. To suddenly have all that wrenched away is like losing someone you hold dearly in your heart. The Empire already took my daughter from us, but by Talos they will not take our homeland!" Should you ask, she will also tell you what happened to her daughter: "I trained our daughter Lilija as a healer... to one day tend the Shrine of Talos and replace me as a Priestess of Talos. When the fighting began over the White-Gold Concordat, she ran off to join the Stormcloaks. She had her father's fire, how could I say no? She died out there, only having tended to the wounded soldiers for a few months. We never even found her body... the Empire burned all the dead." Despite her being a priest, if you give her a religious pamphlet, she will be disgusted: "Ugh. Get this awful paper away from me, by Talos!" During this quest, Nura and Vulwulf will be found in Solitude attending Asgeir's wedding to Vittoria Vici, an Imperial. Nura may comment with "If my Asgeir is happy, then I'm happy. Really. ", "To think, my little boy is married. And to an Imperial. Oh, they grow up so fast. ", or "Vittoria may be pretty, but does she have the right hips for the job? I want grandchildren, and lots of them." Asking her if she's having a good time will have her say, "Oh. Why... why certainly. I keep telling myself I'm not losing a son, I'm gaining an Imperial. Daughter. An Imperial daughter..."
As Vittoria Vici lies dead, Nura can be found yelling, "By Ysmir, this is horrible! I never wanted the girl dead, I swear!" Nura: "You need to be easier on Asgeir. All he wants to do is please you." Vulwulf: "It would please me if he'd take up arms and fight for [sic] to save his homeland. Is that too much to ask my own son?" Nura: "That's right. He is your son. He has his own hopes and dreams and we have no right to tell him otherwise." Vulwulf: "You can't deny the fact that he needs to give back to his people; to fight to keep us free. You healed the wounded, Nura. You saw their life's blood spilling into the mud, giving back to the land. No. I'm sorry, I've worked too damn hard to let his life go to waste." Asgeir: "Mother, what can I do to make father happier? It seems no matter how successful I become he doesn't care." Nura: "Of course he cares. You just have to understand that your father was a soldier and he'll always be a soldier. He just wants you to follow in his footsteps." Asgeir: "I understand. It just isn't me. I'm not a warrior and I don't think I ever will be." Nura: "Then by Talos, you do what you feel you're meant to do. I'll take care of your father for you." If the Imperial Legion takes over Riften, you are supposed to be able to ask Nura what happened to the shrine of Talos. She would have bitterly told you, "Now that the Imperial blight has poisoned Riften, the worship of Talos is strictly forbidden by the terms of the White-Gold Concordat. They can defile our shrine, they can arrest our people and they can silence our voices, but the Empire will never destroy our spirit. As long as we keep Talos in our heart, his legacy will never die." However, since she stays home all the time, you will have to trespass to enter her house and speak to her, causing all her dialogue to be replaced with generic lines telling you to leave. She is unable to sleep due to a problem with her sleep package. If Nura is dead, she will nevertheless "come" to Vittoria Vici's wedding during the quest Bound Until Death. Her dead and naked body will spawn at the place she's supposed to stand. Esta página foi modificada pela última vez à(s) 09h45min de 13 de agosto de 2014.